Unite, has launched an exciting new history project aimed at engaging directly with a new generation of workers and activists. The project – a centenary history of the Transport and General Workers’ Union (TGWU) – will be history with a difference, involving trade union activists across Britain engaged in their own original research, including first-hand account interviews on the history of their own work places, sectors and regions. These case studies will enrich the six-part national history of the TGWU, the first volume of which will go to print in summer 2020. 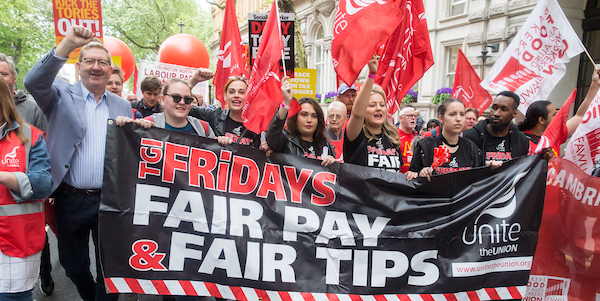 It comes as the trade union movement faces the challenges of the changing and modern world of work, including making itself relevant to those in precarious work, on zero hours contracts and in the gig economy. The themes of equalities, the nature of work, how trade unions interact with the Labour Party and the state will be at the project’s core informing analysis of unions in today’s society. Opening with the amalgamation of 14 unions to form the TGWU to create the first integrated general industrial union in 1922, the history project tracks the union’s support for the welfare state in the 1940s, the response to the attack on trade union rights in the 1970s, up to dealing with new challenges of neoliberalism in recent decades. Len McCluskey, general secretary of Unite, which was formed from a merger between the TGWU and Amicus in 2007, said of the project, “I am immensely proud of my trade union, the TGWU, which I joined more than fifty years ago on my first day working on the docks in Liverpool aged 18. The rest, as they say, for both my union and for me, is history. And that’s why this project is so important because those who cannot remember the past are condemned to repeat it. The Unite history project is being launched just as a separate trade union exhibition at Sutton House in Hackney London begins. The exhibition documents the life of Clive Jenkins, general secretary of ASTMS, a Unite predecessor union and runs until June 2 Find out more here.